I can recall in the off-season when Vancouver signed Nigel Reo-Coker some people criticized the signing with the most common comment being, “Why are MLS clubs always signing these old players?” The reality is you could argue that Reo-Coker, who was 28 at the start of the MLS season, is no longer Premier League quality and most likely a Championship League player in England, but this is not necessarily due to age but rather Premier League clubs being capable of buying players at a greater skill level than what he offers. With high profile tournaments marketed by FIFA such as the Olympics, U-20 World Cup, and even regional tournaments designed for younger players, it's easy to think that a large amount of professional players are very young, although the reality is the opposite. Based on current rosters for the 2013-2014 English Premier League season, the average player age is 26.2 years, and this includes eighteen to twenty year old reserve players who will not play any games. The average age of starting players would be closer 28-29 years of age. Even ‘developmental’ leagues such as the Portugal Superliga have an average age of all players being 25.3, Brazil Serie A 25.1 and the Dutch Eredivisie 23.5. The MLS average age of 27 is only slightly older despite having five goalkeepers in the league over 35 years of age. As noted previously, I manage a database of over 60,000 soccer players from around the World and have statistical data on each player for at least five seasons, and many their entire career. With Soccermetrics we have been doing some tests with this data in trying to understand better when soccer players reach their prime and what is the traditional bell-curve of the average professional soccer player. The work is still in development, but on average, in terms of games and minutes played, a soccer player becomes a regular starter between 21 and 23 and is in his prime between the age of 24 and 29. The average player plays professionally for close to eight seasons with five being in the top division. MLS turnover tends to be greater due to the salary cap, although MLS has created a number of life-long MLS players who played eight seasons in the MLS and beyond. As mentioned in my previous article, the greatest issue MLS faces is the development of players into the starting line-up towards becoming integral components at the magic age of 24. This is one reason I've been a great supporter of the NCAA Soccer system, since it allows players to develop for four seasons between the age of 18 and 22 at no cost to MLS teams. Although I will admit there are developmental concerns with college soccer having non-professional rules, such as unlimited substitutions as well as under NCAA amateur guidelines MLS can not control a player rights while the player is attending college. This issue recently raised its ugly head with Canadian striker Daniel Haber deciding to leave school early and sign with Maccabi Haifa in Israel instead of being available in the 2014 MLS draft. As you can see in several sports and across the globe, MLS has many issues in overall league management and player development. However, like the Oakland Athletics did famously with the "Moneyball" concept, in situations of chaos and uncertainty you look to see where you can take advantage of the system. I believe one opportunity exists which is completely ignored by MLS, and that is the continued observation and tracking of players who try to remain in the game to the magic age of 24. This can be done by following the USL Pro and NASL more closely and even leagues such as the PDL, NPSL, USASA, USCS and the CSL. There are successful models using this system and has worked in recruiting players, such as TFC signing Jonathan Osorio. Although the greatest example, and admittedly one of the worst preseason predictions I have ever made, is the development of the NASL side Atlanta Silverbacks. I projected them to finish last this season based on the teams senior players and instead currently top the table. The main reason for this is Technical Director Eric Wynalda has brought in a number of players from the amateur team he used to manage USASA side Cal FC, a team I unfortunately don't cover in my work or database. One league I do cover is the PDL, one that mostly gives a chance for current NCAA soccer players to play soccer over the summer and maintain their amateur status. Although there are exception to the rules, with teams using older players who have already finished their college careers or players from Africa, South America and elsewhere who happen to be currently located in Canada and United States. Three Canadian teams have taken great advantage of this system as Thunder Bay, Ottawa and London have after the 2013 PDL regular season a combined record of 33 wins, 4 losses and 5 draws. The Ottawa Fury (11-1-2) was lead by striker Carl Haworth, the 23-year old forward dominated the season statistically with 12 goals and 12 assists in 12 games. He also had a very successful college career and was listed in my top 100 draft prospects, was drafted by Montreal in last season’s supplemental draft but not given a contract. Forest City London (10-2-2), last years PDL champion, traditionally recruit younger players in college, although this season’s team includes 22-year old Aaron Boyd who scored 11 goals in 14 games and would be willing to sign a professional contract now. 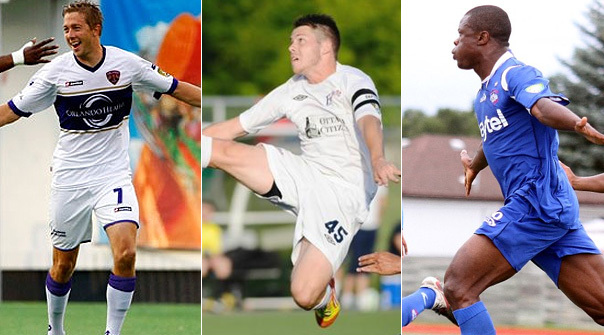 Finally, the Thunder Bay Chill (12-1-1) who made it all the way to the 2013 PDL championship game, have been lead by 24-year old Nigerian Sunny Omoregie who has 8 goals and 5 assists, and 26-year old Spanish midfielder Sergio "Sota" Campano who has 7 goals and 4 assists. As soccer continues to develop in North America, hopefully opportunities for players do as well. Unfortunately, with the announcement of potentially four new MLS expansion teams, this means the game at the highest level is growing much quicker than other aspects of the game. In a few seasons, teams will be forced to find players wherever they can just to fill their rosters. I feel if a team wishes to succeed they need to take advantage of these player development pipelines, adapt to available skills and stop worrying about age or pretending they are going develop a 15 year old kid into something better than what is already available across several divisions below MLS.